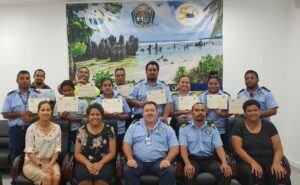 Under the PACER Plus Project Readiness Package, the OCO organized the PACER Plus Rules of Origin (ROO) Workshop in Nauru on 18-19 February 2019. The workshop was facilitated by the Nauru pre-accredited PACER Plus ROO Trainer. During the Workshop, the participants learnt about ROO concept, practical issues for proper origin determination and the ROO criteria and verification procedures under Chapter 3 of PACER Plus. The Deputy Secretary Finance of Nauru Ministry of Finance, Mr. Richard Brennan in his remarks at the opening of the Workshop “talked about the important role that customs play in the implementation of the ROO and to ensure better understanding so that only goods that qualify are granted preferential duty rates. He acknowledged the work OCO is undertaking to develop local trainers on Customs subject areas.” The participants at the Workshop provided positive feedback on the performance of the pre-accredited trainer and this would form part of the final assessment that will be provided to their respective Customs Administrations.